Protesters in front of Stenbock House. The first major compromise was made in regard to the platforms of Center and Isamaa, according to which most state-owned companies need to be at least partially listed. EKRE’s program does not include relevant promises. It was not said which state companies would be listed. The second announcement was that heads of the three parties agreed that “immigration policy would maintain a strict line and one to benefit the economy and society”. “There was some debate over which kind of exceptions to allow, but it generally went well. We know all too well that the Estonian Academy of Music has for years taught students from China whose level corresponds to that of children attending the first year of music school and whose squeaking and tweeting the academy’s professors are working to turn into something decent,” EKRE leader Mart Helme said. The third major agreement concerned the field of transport. Center Party head Jüri Ratas said that all participants agree that Estonia’s three main highways need to have four lanes and that the state should borrow to that effect. “We really are not afraid to use loan money,” Center’s deputy chair Kadri Simson added. It was decided on Tuesday the coalition would support feasibility surveys regarding the Tallinn-Helsinki tunnel and an accessible public transport network. “A connection between the mainland and the islands was one of the things we discussed,” Ratas said. Isamaa leader Helir-Valdor Seeder hopes the government will manage to balance the budget. While Isamaa’s main promise of making the second pillar of pension voluntary was discussed briefly, it was quickly shelved again. “We touched on that subject once, but we will come back to it in the future,” Seeder said. The first week of talks for a potential coalition has seen EKRE surrender a number of its core promises: bigger defense spending, paramilitary border guard, end to state-funded abortions and a lower VAT rate. 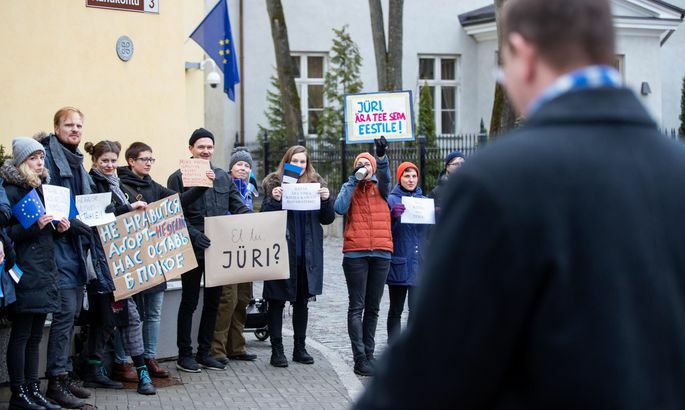 On the morning of the eighth day of talks, representatives of Center, EKRE and Isamaa were greeted by a few dozen protesters in front of Stenbock House. Mart Helme told the protesters that they have misunderstood and are poorly informed. There seem to be communication issues inside EKRE as well as the party’s defense policy representative Leo Kunnas was under the impression matters pertaining to national defense remain open. “What we saw was a general statement to overturn misconceptions,” Kunnas said. He believes there is still room for discussing EKRE’s promises of a paramilitary boarder guard force and defense spending of 2.5 percent. Mart Helme said agreements are in place in these fields – as well as the matter of abortions – and that these three EKRE proposals will not be included in the coalition agreement. Isamaa and EKRE scored a point in tax questions yesterday after Center agreed to lower excise duties on alcohol. It was the national conservatives’ turn to give in when Mart Helme said that partners did not support their proposal of lowering VAT to 15 percent. Calculations by the finance ministry suggest doing so would cost €570 million. President Kersti Kaljulaid will propose the formation of the government once the new composition of the Riigikogu has been sworn in and the current government has stepped down. This will take several more weeks since election results have not been confirmed yet, with the electoral committee in the middle of processing complaints. “The president said a week before elections that she will make the first proposal to the winner of the elections,” the president’s press representative Taavi Linnamäe said. The Reform Party won the March elections.